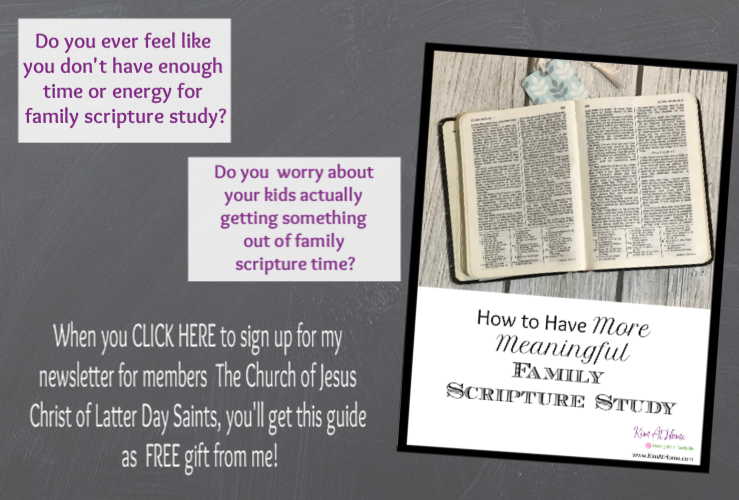 The phrases “remodel your home into a center of gospel learning” and “transform their home into a sanctuary of faith” have been rolling around in my head since the moment they were spoken by President Russell M. Nelson (“Becoming Exemplary Saints”, October 2018 General Conference). This is the task before us! Some find it exciting while others find it intimidating. For my thoughts on it, I have to take you back about 2 months prior to this historic general conference where it was announced that we would be moving to a home centered church and reducing the time we spend at church meetings. It was a typical Sunday after church. Our kids, age 4-10, don’t spend Sundays being bored. They build forts, build with blocks, and play dress up. The house is full of imaginative play. While I loved it, I knew that we had enough time in the day to add some other good activities. But with church smack dab in the middle of the day and me coming home from church exhausted every week (I’m currently serving in the primary presidency and while I love it, I am burned out when I get home), it just wasn’t happening. On this particular Sunday, I had a strong desire to start working with my oldest on some family history, to get the other kids writing letters to family members, to teach and read to my kids, and to bake some banana bread to take to the new neighbors. But not one single item on that list happened because I was too worn out and by the time I had some energy back there just wasn’t enough time. And I found myself wishing that it could be different. At the time, I didn’t have any idea that a change in the church schedule would be coming. But I was longing for more time to teach my kids. I knew they had great primary teachers that were teaching great lessons (and they were learning a lot), but I felt this powerful need to do more teaching at home. Even though we were having family home evening and regular scripture study, I felt like that just wasn’t enough. So, when the new schedule was announced, I was beyond thrilled. My mind immediately went back to that one Sunday a couple months before and I felt like my prayers had been answered. But I wonder if that one special moment of frustration 2 months earlier was Heavenly Father’s way of preparing me for the announcement that He knew was coming. Centering our home, for us, has had a lot to do with intentionality. We ask ourselves why we are doing something. Is this activity going to bring us closer as a family or empower us to serve others better? If not, it can drop out of our lives. This practice helps us prioritize, cut out the clutter and focus on what matters most. I have really tried to focus on creating a home that is centered on Christ. I feel like as a Mom, that needs to be my main effort. From the artwork to quotes around the house , yummy breakfast and scripture study time and trying to maintain a space where the Spirit can be felt, that goal remains important. One of my favorite things we have done as a family is to memorize The Living Christ during our evening scriptures and prayers. It changed our family. There are many ways to make it fun- especially with littles: put it to music, make a matching game to put sentences together and more! Memorizing this great holy writ, given by latter day prophets will increase your family’s testimony of Jesus Christ- and isn’t that our goal?!? Having a home where you teach the gospel is more than the lessons you formally prepare and teach. It’s in the simple moments, it’s allowing religion and spirituality to enter your daily dialog as a family. When you lose your keys, do you run around frantically searching or do you pray first? When a question is brought up do you turn to YouTube or the scriptures? Leading by example on a regular basis will have a lasting effect on your family and your homes environment. We use daily devotionals in our home to set the tone of the day right, first thing. If my husband isn’t here we will call him at work to do the devotionals with us over the phone. Every day is a different theme, and because we do them first thing- they stick with us the rest of the day. The whole goal of home-centered, church-supported worship is conversion. We really try to have our kids be teachers and testifiers in our home. They each take a day of the week to be in charge of scripture study, and they all take turns conducting FHE and teaching the lessons. 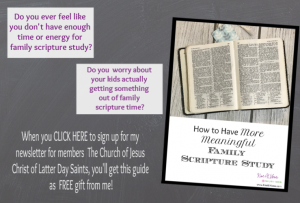 We also have a family testimony meeting on fast Sunday so we all (8 of us, kids ranging in age from 4 to 16) have the chance to testify and share what special experiences we have had in the last month. I will be the first to admit we made many mistakes while raising our family. We were far from perfect and somehow they still turned out okay. Looking back on what we might have done to make our home the center of gospel teaching makes me think of lessons learned in the Book of Mormon. Over and over we are reminded of the traditions of their fathers. Those traditions seemed to be a determining factor in where the hearts of the children ended up. Did they love God? Or did they love the world? As we raised our family we tried to be intentional in our traditions. We made conscious choices about what would bring the spirit into our home, and how we would allow the Spirit to teach our family. Sabbath day observance was a priority, attending church every Sunday even when on vacation. We tried to demonstrate our love for the Savior through example by loving as he loved, making His way our way, and serving with all our heart. There was no doubt in our children’s mind about whom we were loyal to. Creating a home where gospel learning is at the center requires the Holy Ghost. We invite the spirit into our home when we are obedient to the things the Lord has asked us to do. Without the Holy Ghost there will never be any real gospel learning. The reality of having two toddler-aged boys mocks any overly-serious attempts at cobbling together a “center of gospel learning.” I focus on truly believing the words and examples of Christ. As I do, I treat my children as He would treat them, and counsel them as He would. I know the stories of Jesus, so I can tell them at any time to teach, reward, comfort, or encourage. These are all great ideas that can serve as guidance and inspiration as we work to turn our homes into a “sanctuary of faith”, a “center of gospel learning”. If we each will look for good ideas and pray about it, I know that we will be directed to what is best for our families. 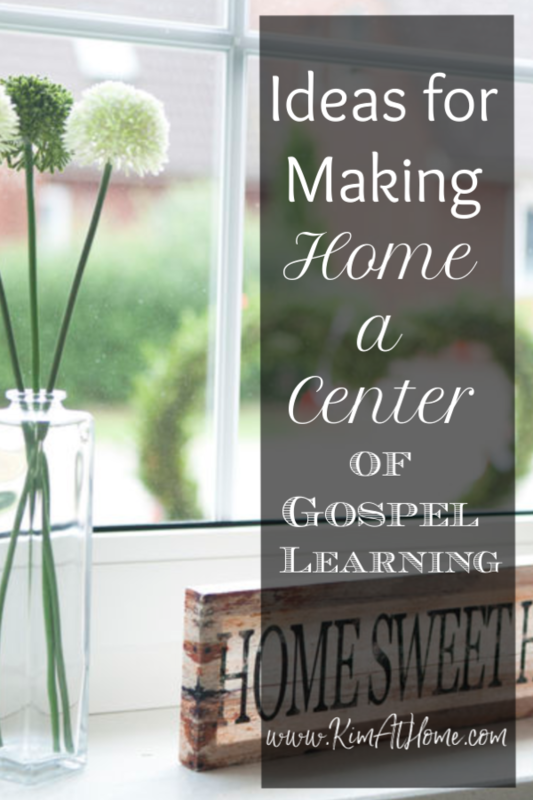 I’d love to hear what you’re doing too, so leave a comment below to share how you make your home a “center of gospel learning”.